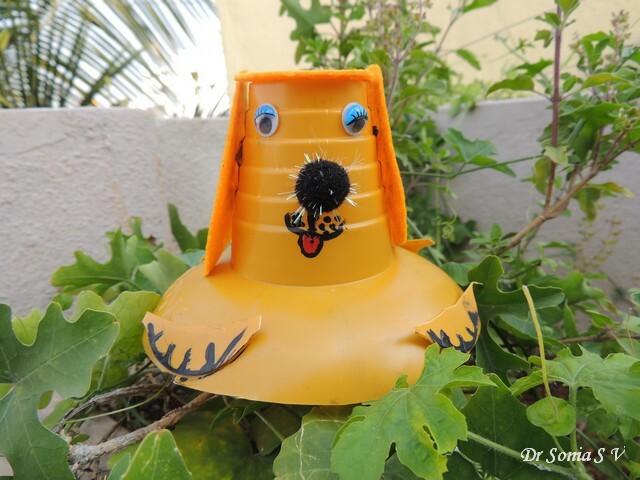 Plastic Cup Craft - Puppy Power ! 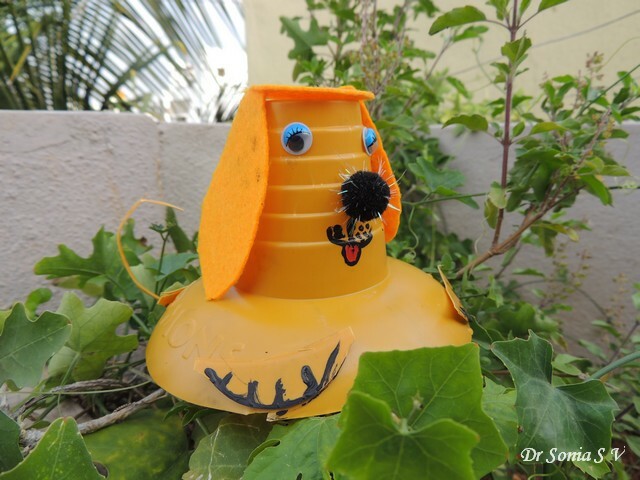 Yes you guessed right...this "Puppy" with long floppy years was made by my daughter .I think the inspiration is our Cocker Spaniel Goldy who has been her companion since she was a year old! 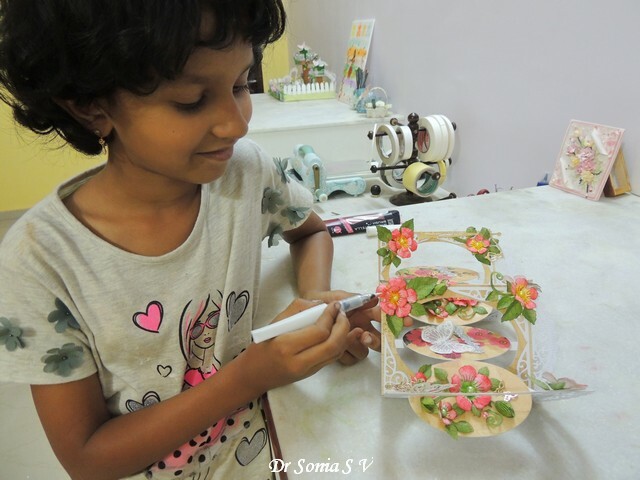 It is so heartwarming to see crafting being encouraged by big brands these days.Yesterday I took my daughter to a shopping mall and she had an Ice Snow Gola [ basically an Ice Lolly] in a cup.They encouraged children to recycle their plastic cups into craft creations and upload a picture to the Snow Gola FB page! My daughter enthusiastically designed and made this Puppy with felt ears [which she cut herself] and a pom pom nose! 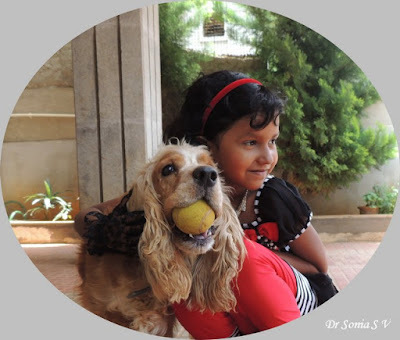 Her puppy"Goldy" looks so happy, dont you agree! 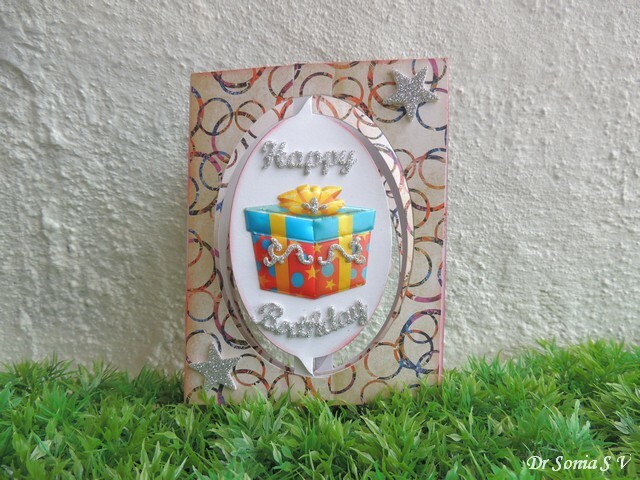 This Pop Up Card made with stickers made me nostalgic about my crafty journey.Many of you know I started this blog to share crafty school projects like this Interactive Day - Night Slider Card I made for my daughter who was then 3 yrs old and attending a school which placed a lot of importance on hands on learning and home involvement! 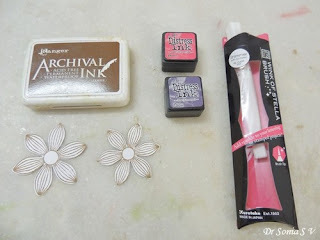 Since I had no knowledge about stamps in any form I relied on drawing and stickers for all my crafty projects! 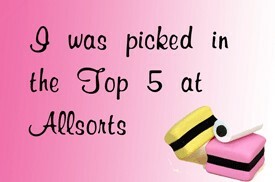 Not just in 2010 when I started this blog but for a couple of years more and yeah I have a serious sticker gazing and buying addiction [ And I even steal my daughters stickers...!]! 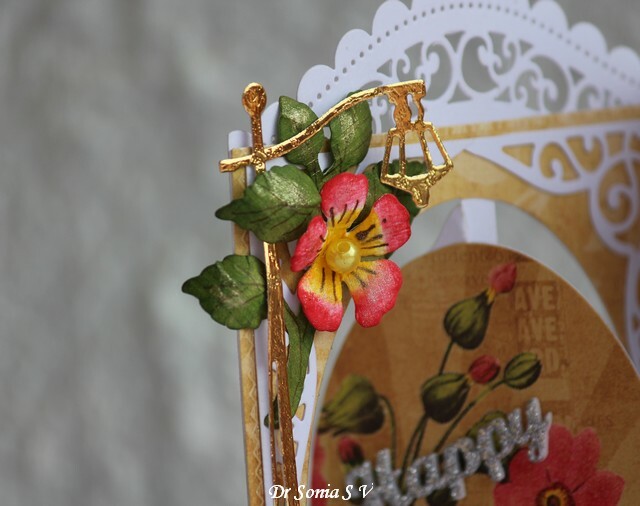 One hardly ever sees stickers being used in serious papercrafters' projects...maybe they are perceived as too kiddy...well I did dress up my stickers with leftover diecuts swirls and scrolls from some Spellbinders dies in an attempt to glamorize them! And yes I seriously love glitter foam....I think I would go into depression if glitter foam went out of the market!No seriously...I think they are my most loved crafting raw material! 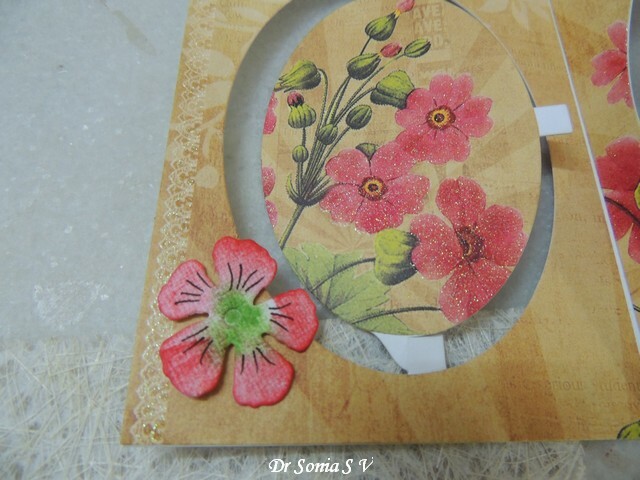 The interactive Pop Up oval panels in this Pop Up Accordion Card [made using Karen Burniston's Oval Accordion Die] helped add some style to an otherwise super simple card! 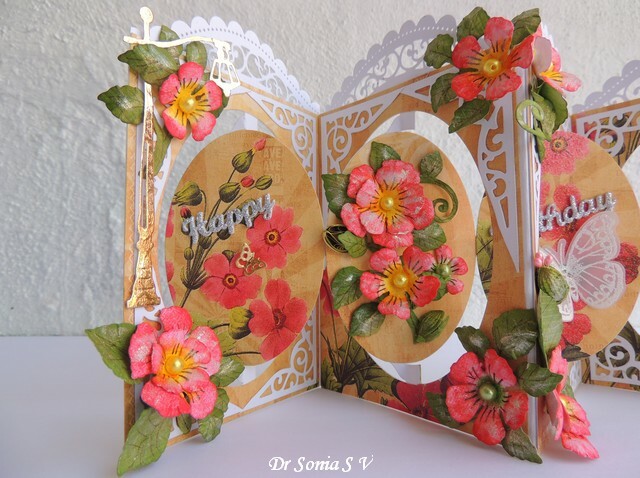 I resisted adding bulky embellishment and so this Pop Up Card folds absolutely flat for mailing! 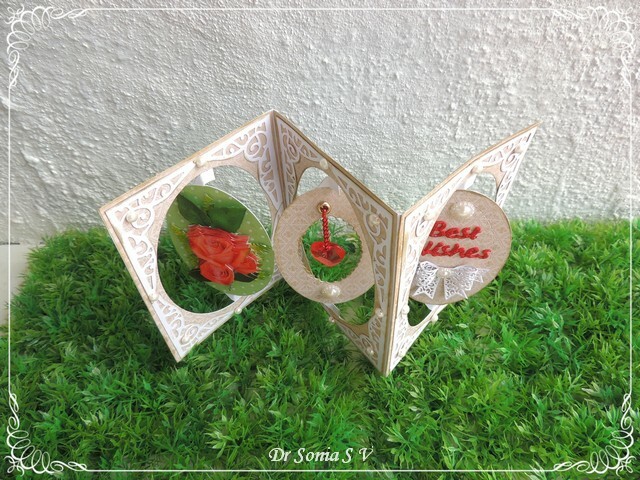 Hi friends Thank you so much for the kind words on my Pop Up Dangler Card. 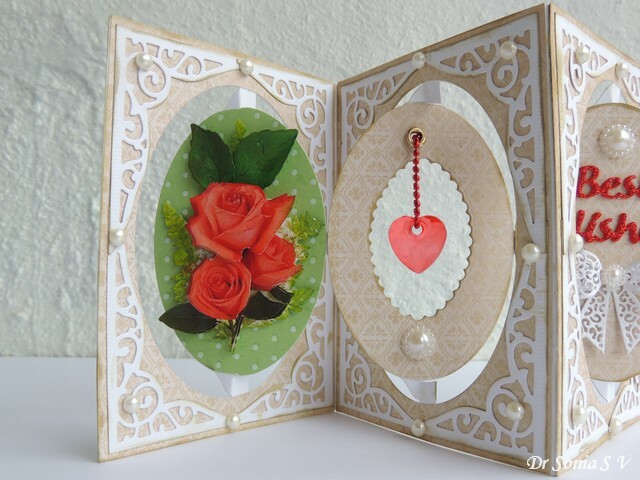 I am in love with Karen Burniston's Oval accordion die and here is one more card made in the accordion pop up style. 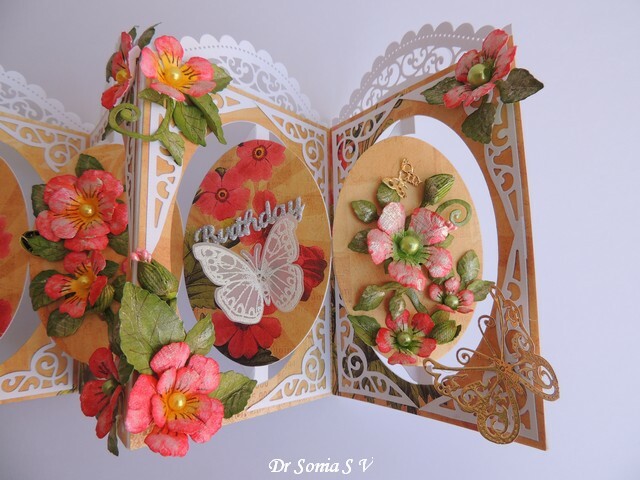 I love 3 D decoupage[ otherwise called paper tole] and this type of card design is ideal to showcase such dimensional images! My little fairy smelling the violets has so many layers and was a toughie to cut and assemble but worth all the effort! 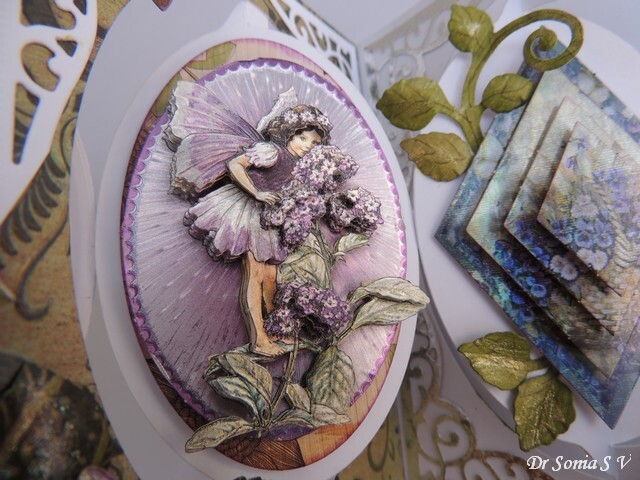 I used 3 different 3 D decoupaged images in this card and all have a metallic shimmer and purple shades so made my paper blooms to match them using distress inks and wink of stella[ similar to how I made the flowers here: Shimmer Flower tutorial ]! 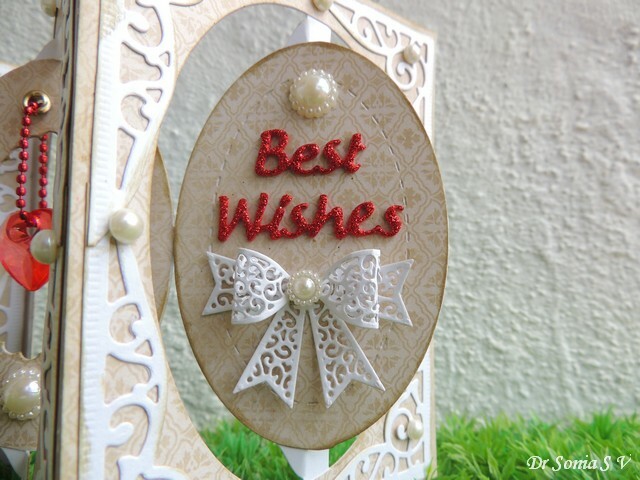 The "Best Wishes" was die cut from glitter foam and I made the lacy bow from pattern paper to match the rest of the elements on the card. My favorite Cheery Lynn Butterfly! 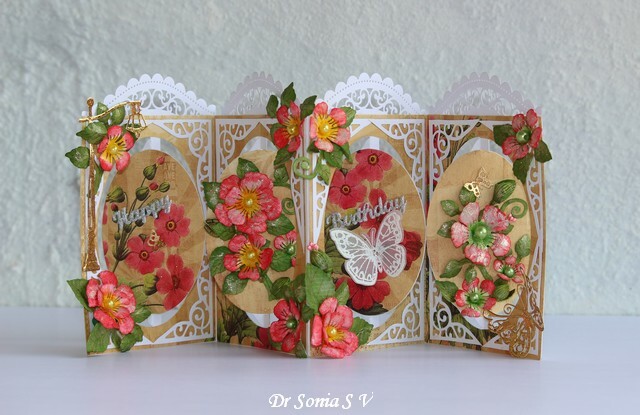 I love how this style of card folds up and expands! 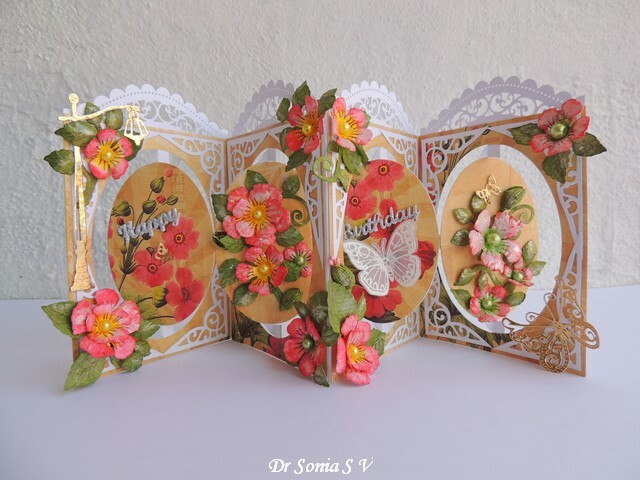 I hope you like my 4 panel accordion card. 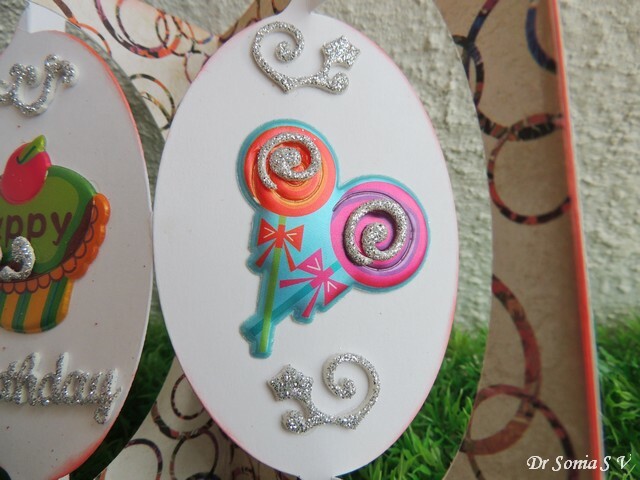 A couple of years back I shared how to make a pop up dangler card and that was a tricky to make dangler but the mini tutorial to that card is still floating around on pinterest! 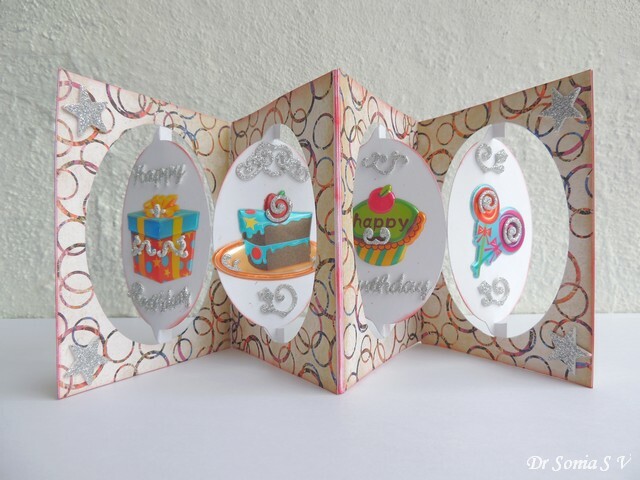 I used Karen Burniston's Oval Accordion die [also featured here : Pop Up Accordion Card] to make this 3 panel accordion card with oval pop up elements. 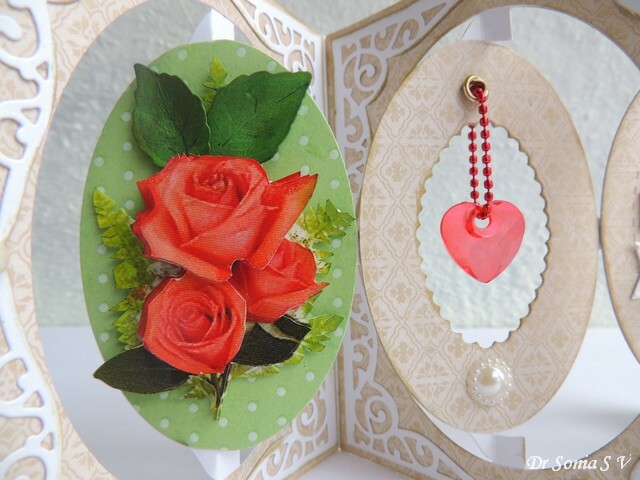 The dangling heart on this interactive card was quite easy to make as I used the nesting oval dies in the accordion set to cut a scalloped oval from the central oval and used my Crop a dile big bite to punch and set an eyelet to thread the dangling heart! 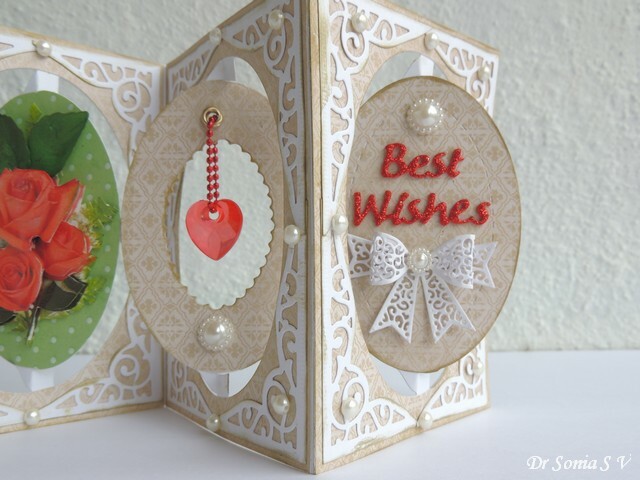 Most interactive cards are a bit challenging to make but this one featuring 3 interactive elements- accordions, pop ups and a dangler was easy and fun to make. 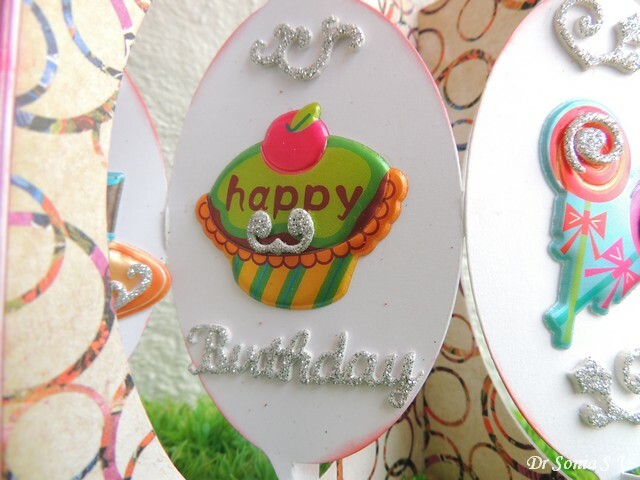 I hope you like my dangler Pop Up Card. 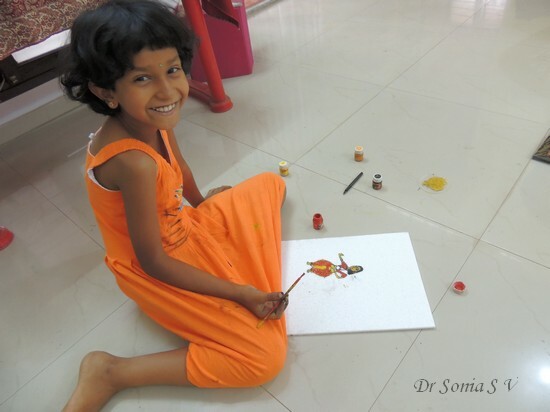 Being a doctor I meet professionals from all wakes of life but I must admit I am always fascinated by artists.Recently a very talented patient of mine Srikala Gangi Reddy [ a software professional turned artist] invited me to her Art Exhibition.Since my little girl [who will turn 9 this month] loves to paint and draw I took her along with me to the painting exhibition. 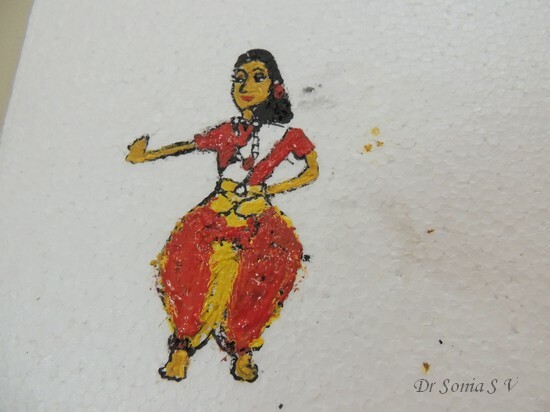 The theme of the painting exhibition was the Indian classical dancer and Srikala's work was awesome but I didnt realise how profoundly it had affected my daughter till a week later she drew and painted this "dancer" on a sheet of thermocol [styrofoam]! I let her have a free reign on my stencil collection and inkpads [yeah she is allowed to use my distress inks too!] and she added colorful Ganeshas to "bless" her dancer! 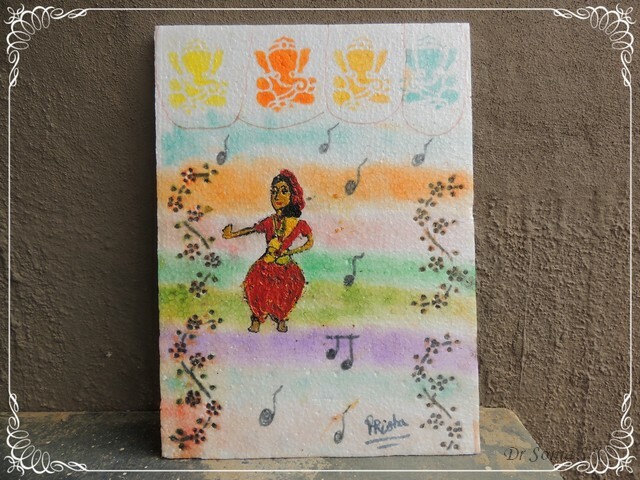 I suppose a dancer needs music so the little artist has drawn muscial notes on her thermocol canvas! 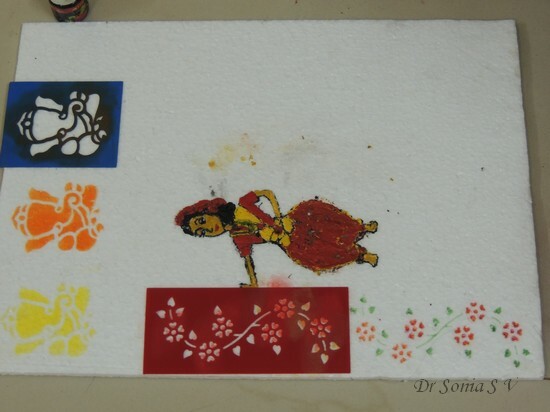 And she made a background for her dancer by sponging with inkpads. I was amazed at how minutely she had taken in all she saw at the Painting exhibition including adding a signature on her painting! Little minds are so impressionable and I am so glad I found time to visit the painting exhibition! 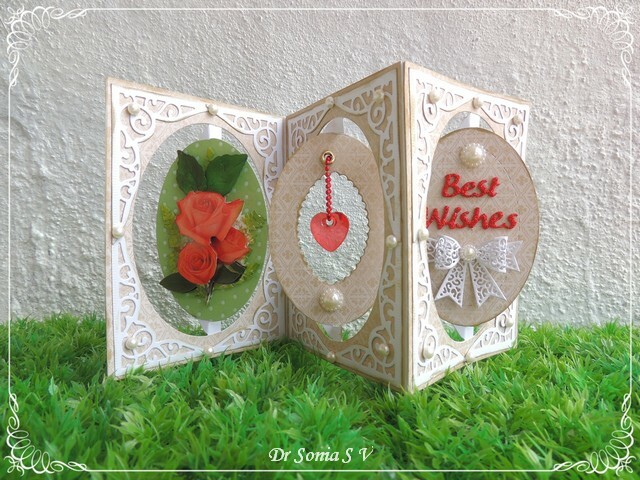 Hi friends Thank you so much for all the appreciation you showered on my Spinning Pop Up Ball card.I made that particular pop up card using a Sizzix die designed by Karen Burniston. 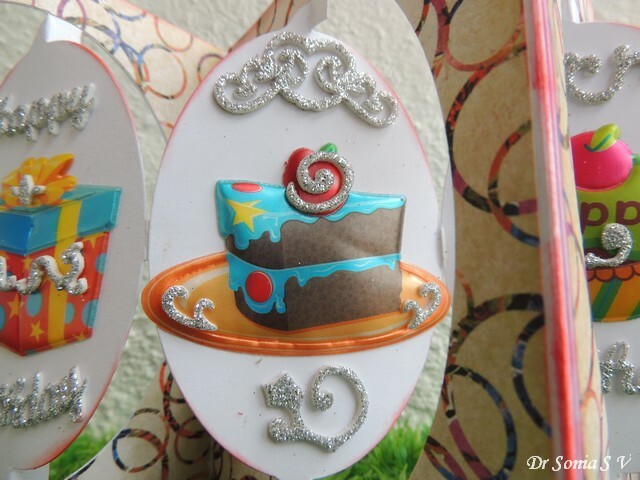 Making the pop up ball card using Karen's die was such a breeze that I promtly became her fan and so for my DT project from Crafters Corner I picked up another die designed by Karen Burniston .Karen 's pop up card dies are so cleverly designed that they tackle all the difficulties of pop up card making and help crafters of all levels make fun interactive and crazily "wow" pop up cards with ease. 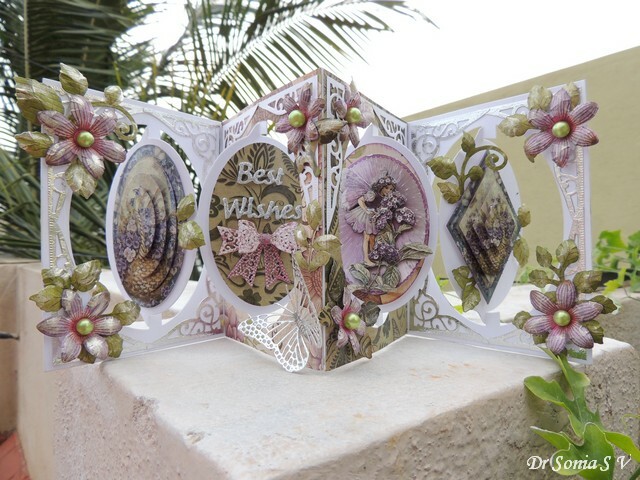 I made this Pop Up Accordion card using the awesome Oval Accordion Die Karen had designed for Elizabeth Craft designs.Using this die you can make accordion cards with 2 to "n " number of panels and the most spectacular feature of the Karen's pop up accordion cards are that they also feature pop up up elements which swing out on opening the card! 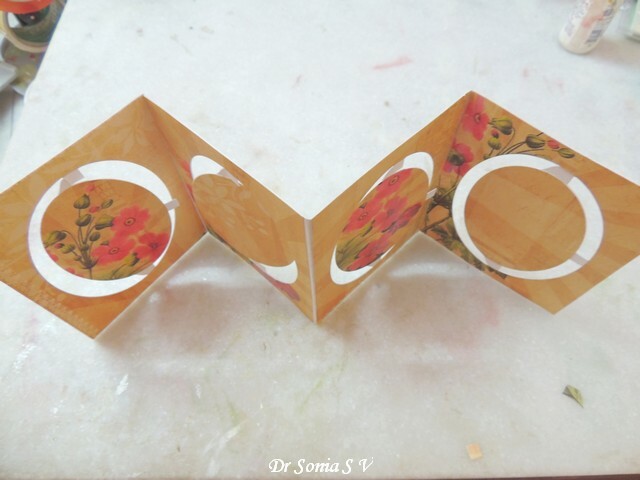 To make this Accordion Pop Up card I layered the pattern paper on the thick card base [ thick cardstock is crucial to the success of this design]. 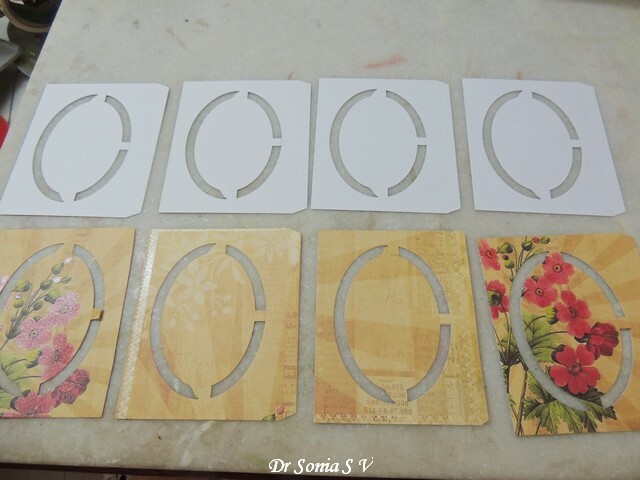 Each die cut panel has a tab on one end and you can attach the tabs to create card and albums with multiple panels. 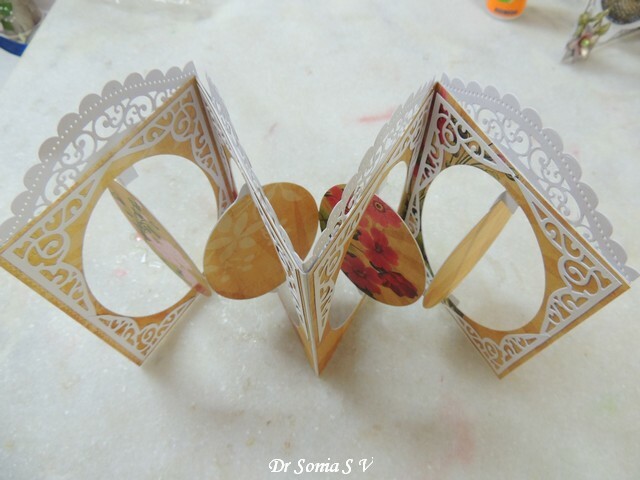 After decorating and accordion folding the card panels , comes the most fun part...creating the swinging pop up elements! 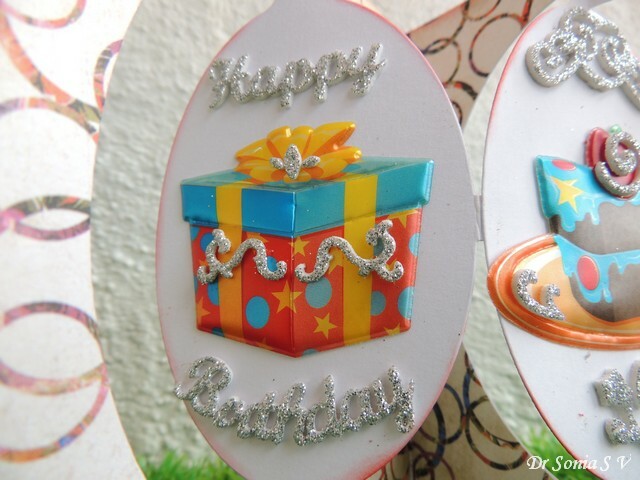 Karen's design is so cool...you just have to add a good adhesive [ best is red tacky tape] to the tab on one oval and stick it under the oval of the next card , a little twist and turn and your pop up album/ card is ready! 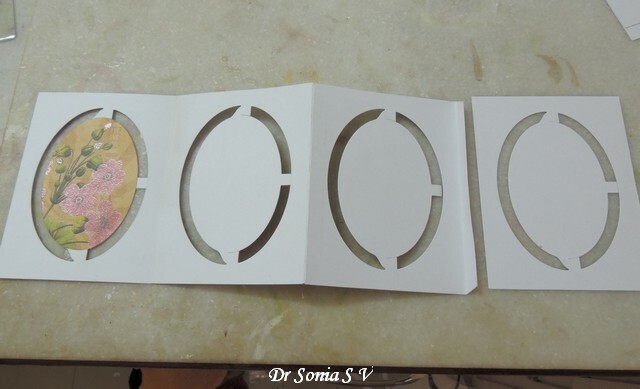 And the best thing about pop up cards/ albums is that they fold absolutely flat to mail! 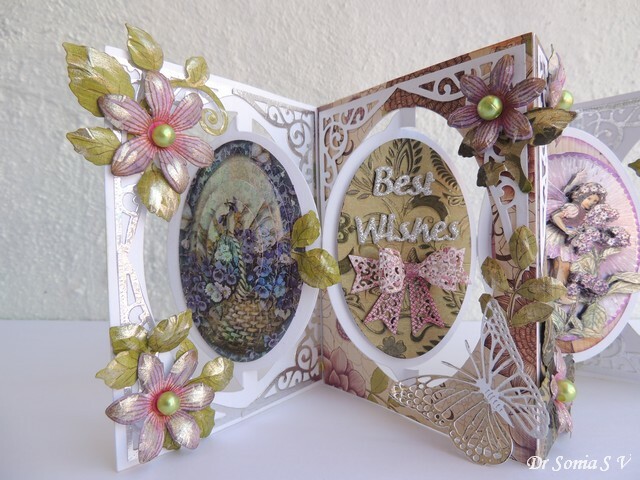 The silvery " Happy Birthday" was cut from glitter foam using Elizabeth Craft design dies.The white butterly was stamped and heat embossed on parchment and and the golden butterflies all over the card are Cheery Lynn . 1. 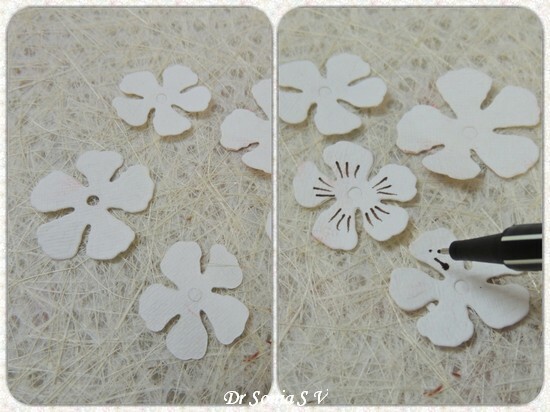 Use off white/ cream paper for your flowers. 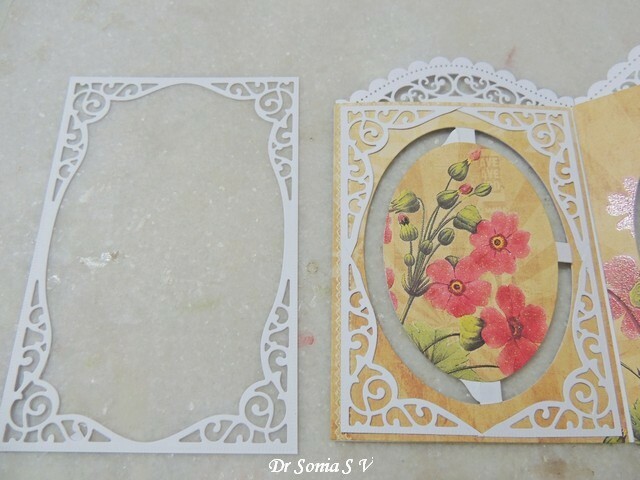 If you regularly use white paper to make punched/ handcut/ die cut flowers, try using off white , cream or yellow paper as it gives a lovely hue to your flowers even after coloring them. 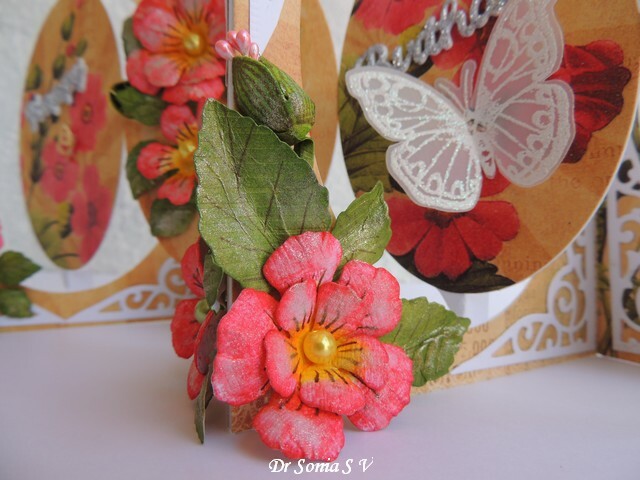 Its fun to work with stamp and die cut flowers such as the popular heartfelt creations flowers but suppose you dont want to invest in stamps here is an equally fun and economical tip : Draw fine lines/ other designs on your flower petals using a fine liner sketch pen or a pencil. I used a brown misaki sketch pen. 3. 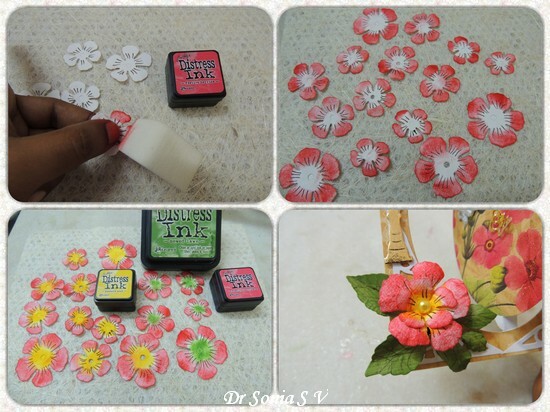 Ink your flower petals in 2 shades. 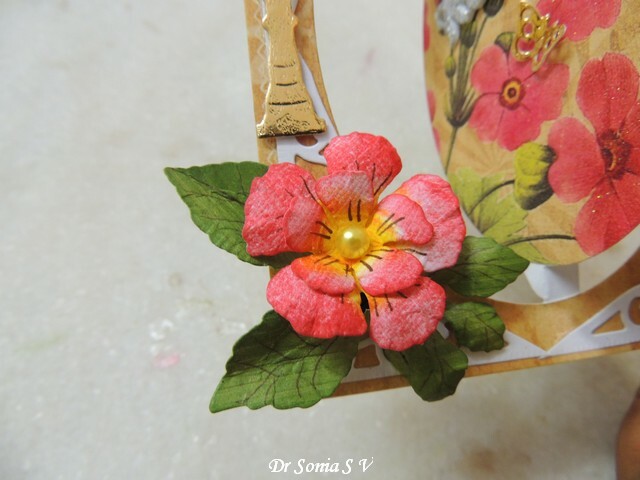 I used the cute , handy and not to mention super economical mini distress ink pads [ festive berries, mustard seeds, mowed lawn] to ink the edges and center of my flower petals. 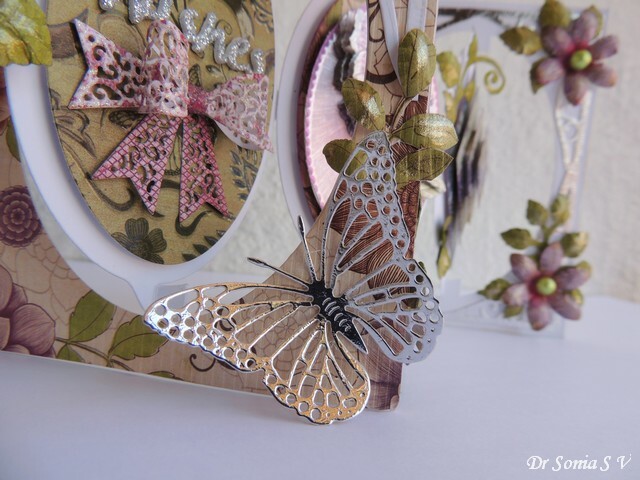 Chose the shades of your ink to match the colors of your pattern paper/ stamped image. 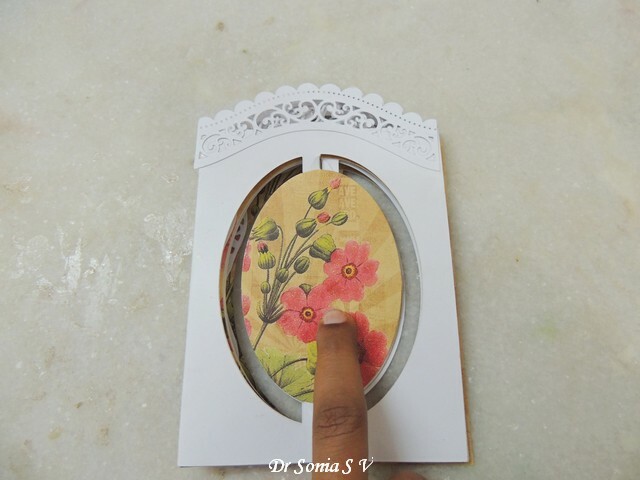 if your dont have time to emboss just pinching / shaping with your hands is enough if your paper is malleable enough! 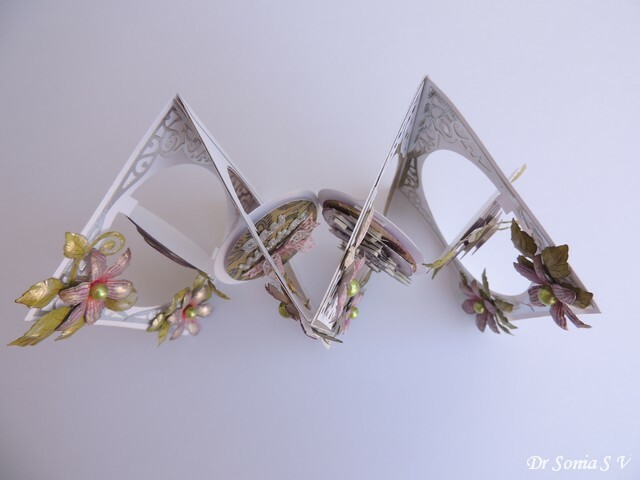 Layering flowers always looks cool! 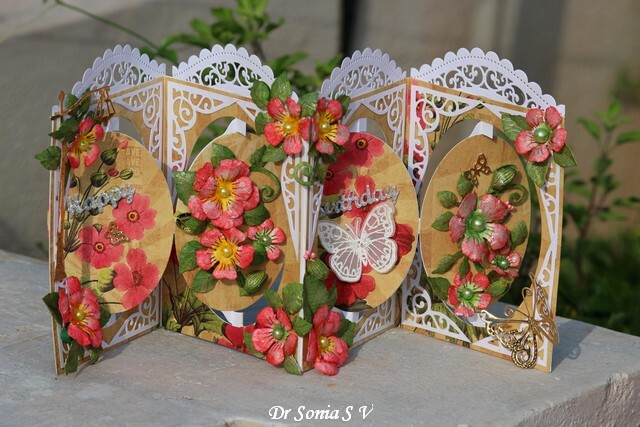 Unless you are making a pop up card and dont want very bulky flowers! 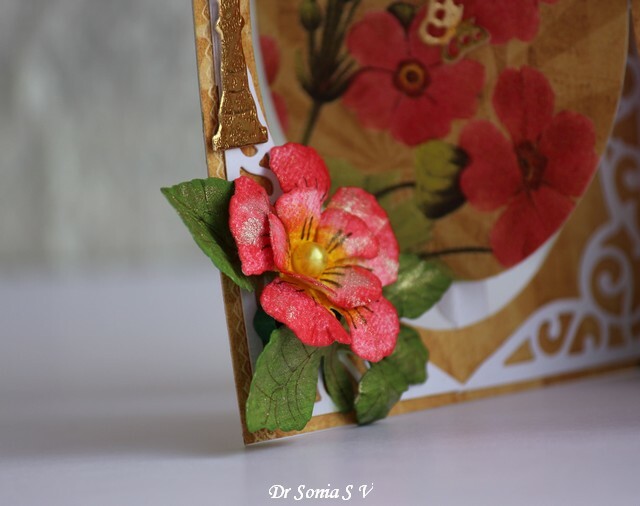 I wanted my flowers to match the shimmering flowers of my pattern paper . Normal glitter would be too garish. I experimented with theWink of Stella brushes and woo I do love the magical shimmer they lend a project! My little helper loved the magic of Wink of Stella and volunteered to jazz up all the leaves and flowers ! 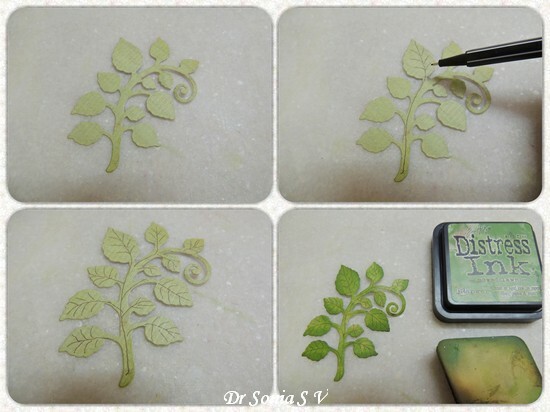 Inking options : Ink in 2 shades of green, add a touch of brown or black to parts of the leaf!Dont ink uniformly-- a mottled appearance is more natural! 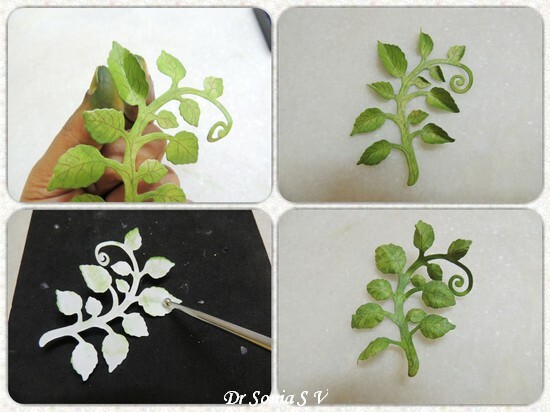 Mix up the elements on your project so that the curvature of the leaves are varied. 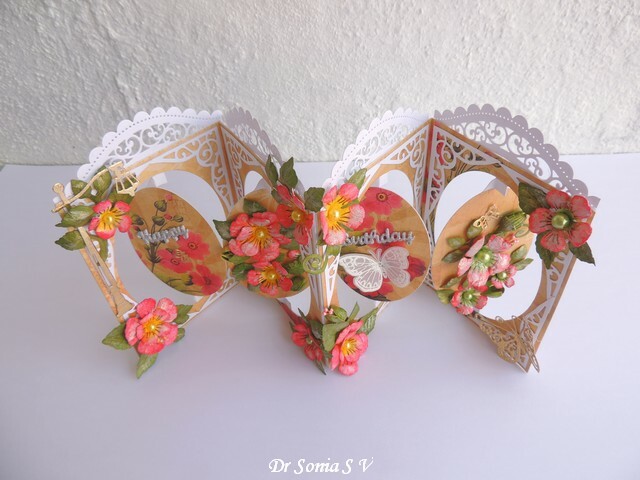 I hope you liked the Pop Up Accordion card with the handmade flowers.Do tell me how it is.